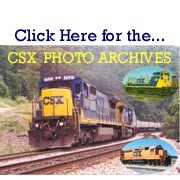 This site is dedicated to preserving the images of the Chessie System Railroads. The Chessie System logo stopped being applied to equipment in 1986, but the beloved mascot and striking paint scheme will live on with many for years to come. Now existing as part of the vast CSX system, the colors may have changed, but many of the locations are still busy, and the memories will always remain. If you like what you see here, think about keeping the Chessie memories alive by supporting one of the Chessie related historical societies. Check out my links to get you to their homepages. Each of them can only exist through your support. Dues are part of what enables these organizations to survive, but equally important is your participation. That little bit of knowledge that you think is unimportant just may be the answer to a question someone has been looking for! We all knew that even with nine lives Chessie wouldn't be around forever! The real question is after we're gone, where will we spend the rest of forever? My Lord and Saviour Jesus Christ answered that question for me by saying if I believe in Him, I will have everlasting life. We can't get that on our own no matter how good we are. That gift only comes through Him. Any questions about your eternity? Please e-mail me, or Click here to visit the homepage of the church I attend. Problems with the Java Menu? If your browser doesn't like the Java menu, click here to see a site map with links to every page on the site. Copyright (c) 2000 Dean J. Heacock. All rights reserved. 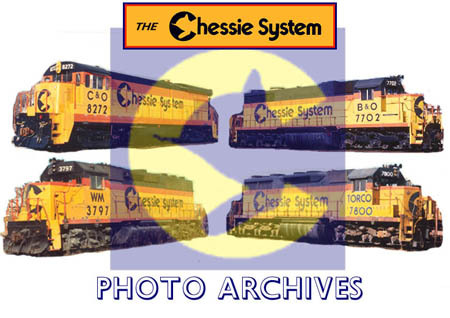 The Chessie System images and logos are registered trademarks. Photos for personal use only. All rights reserved.